Last week, I went over to my local coin and bullion shop to pick up some silver. It's a small place nestled in the corner of a strip mall that I visit often. At the time, silver spot prices were where they are right now — at about $14 an ounce. I bought five one-ounce Canadian Silver Maple Leafs. My total: $109 and change. So even though spot silver was at $14, I still ended up paying about $22 an ounce. When it was all said and done, my total was almost 60% more than the value of the silver at spot prices! Well, I knew prior to going into the store that the premium for these coins would already be quite high in a retail setting. But I purposefully made four mistakes that each bumped up the final sales price with taxes to show you just how much a retail customer can end up paying for a very small silver bullion purchase without doing any research beforehand. 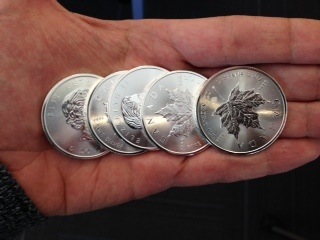 Bullion coins like the Canadian Silver Maple Leaf are generally going to carry a much higher premium than bullion bars. This higher premium starts at the individual mints where bullion coins are produced. As you can imagine, coin production is a long and capital-intensive process. Bullion coin producers pass these costs onto their wholesale distributors. The U.S. Mint, for example, currently charges its authorized distributors a 3% premium on one-ounce American Gold Eagles. For Silver Eagles, the U.S. Mint is now charging its authorized purchasers a standard $2 over spot prices. Pouring a large bullion bar, on the other hand, is much faster and more cost-effective. So producers have fewer expenses to cover and can therefore charge a much lower premium for their products. 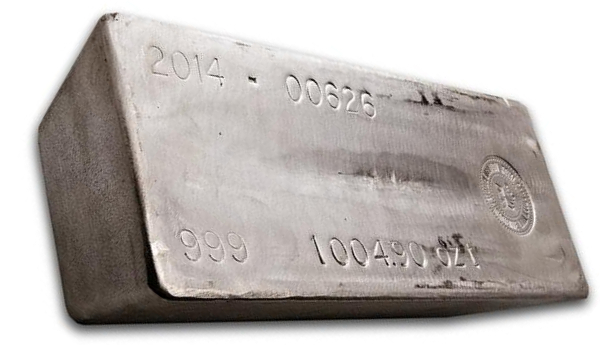 A 1,000-ounce silver bar will carry the lowest premium of all physical silver bullion. These bullion bars are produced by a number of private and government mints, including the Royal Canadian Mint. They can easily be purchased through online bullion brokers and can be purchased as low as around 3% to 4% over spot prices. Compare that to the premium for American Silver Eagles, which currently range from about 25% to 30%, and it's pretty clear that 1,000-ounce silver bars are way more cost-effective. It should be noted that 1,000-ounce bars are not weighed precisely. The exact weight of a 1,000-ounce silver bar generally ranges from 995 to 1,005 ounces. Each bar is usually marked with an individual serial number, its weight, purity, and mint certificate. Like silver, gold bars are also available in a number of standard and non-standard weights. Gold bars weighing 10 ounces and higher can currently be purchased for under a 2% premium over spot. To compare, a brand-new 2016 American Gold Eagle currently carries about a 5% to 10% premium. In short, buying gold and silver bars is going to be more cost-effective in the end than bullion coins. Although it's rarely considered in the decision to buy bullion, purchase volume can make a big difference in the final price an investor will pay for physical gold and silver. The rule of thumb is basically this: The more bullion you buy at once, the lower premium you'll pay. Of course, we've already talked about the 1,000-ounce silver bars being the best value. But even when you go to buy silver bullion coins, bulk purchases are more cost-effective. This is a snapshot of APMEX's prices for brand new 2016 American Silver Eagles. You'll notice that when buying less than 20 Silver Eagles at once, the premium APMEX is charging over spot is more than 30%. But with a purchase of 500 or more, the premium drops to about 25%. It's always a bit more affordable to buy bullion in bulk. Gulp, don't sip. In that chart above, you've also most likely noticed the difference in pricing depending on the method of payment. Charging more for purchases made with a credit card is not an uncommon practice. And this is something that's often found with both online dealers and brick-and-mortar bullion shops. 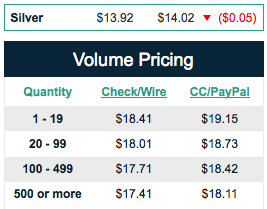 APMEX seems to be charging a 4% fee to use a credit card or PayPal as a payment method. My local coin shop charges a 3% credit card fee. I know because I used my credit card to buy those five Silver Maple Leafs, which added to my final total. It might be worth calling around to your local bullion dealers to inquire about their credit card fees, but it is best to just avoid the whole fee altogether and pay with an electronic check, bank wire, or cash at a brick-and-mortar shop. There is a chance that you won't have to pay sales tax when you buy gold or silver. Of course, every state is going to have different tax rules on precious metal sales. In my home state of Maryland, precious metals are taxed at the standard 6% state sales tax rate. However, purchases of over $1,000 are exempt from sales tax. To the north in Pennsylvania, there are no taxes on bullion sales of any size. So it's important to know your local sales tax code when it comes to buying precious metals in your state. In some cases, it might even be worth a trip across state lines to make a bullion purchase. For me personally, I live at least 45 minutes from the Maryland/Pennsylvania border. So to make a trip to save 6% on a purchase under $1,000 isn't worth it. But for someone living close to the border, it's probably worth a short drive. I coughed up the 6% when I bought those Maple Leafs, which tacked on those last few bucks to add up to the $109. If you use these strategies, you can significantly lower your cash investment when buying gold and silver — particularly the latter. Energy and Capital editor Luke Burgess takes a look at the history and design of the Mexican gold and silver Libertad bullion coins. Energy and Capital editor Luke Burgess takes a look at mining investment opportunities in Peru. Energy and Capital editor Luke Burgess takes a look at the Canadian Gold Maple Leaf coin series from an investment standpoint. Meet the world largest and most expensive gold coin in the world. Weighing in at one metric tonne, this beast is one of the Australian Perth Mint's most extraordinary accomplishments in its 112-year history.